Keep your windshield ice-free! Snow and ice slide right off this heavy duty Teflon™-coated polyester. Magnetic windshield cover clings at a touch to the sides of car with powerful magnets. No more frozen hands trying to remove icy buildup! Windshield protector keeps off twigs, leaves and dirt in the summer. Measures 38 1/4"W x 60"L.
I bought 2 of the Magnetic Windshield Covers. We haven't tried our's yet. But our Daughter has, & says that it works PERFECT! We had 4 to 6" of snow last Nt.So she put her Windshield Cover on her front windshield,swept the snow off of it, took off,& the window,was all clear of ice & snow. Place on car windows at night so frost doesn't need to be scraped off in morning. Great for older parents that have no garage for their car and they don't have to scrape ice in the winter. I USE IT ON MY SUV AND TRUCK. Best thing under the sun!!!!! I should have bought more and gave them out for Christmas gifts. This is the best windshield cover! I love the fact that the magnets are so strong!!! I'm going to buy more for gifts!!! Wonderful product! I live out in the country and not all of our vehicles fit in a covered area, so during those harsh winters, it was great not to have to scrape the windshield. What a great thing to have! It works really great and I love it. Used it this winter on a 2009 Toyota Corolla, and it worked great. It was easy to put on, the magnets helped it stay in place and it kept the snow off the windshield. It's so nice to come out in the morning and take the windshield cover off and drive away. No scraping frost anymore. It could use more magnets top and sides, though. In a strong wind it will come loose. I use this on my pickup. The magnets work great. Gave to college grandsons for Christmas whom all live off campus. I would buy Windshield Cover again. I use it as windshield cover. I used this once. If you have a car, ya need one for the back window ... and something for the sides .... once it snows, still gonna have to shovel off the rest of the car. Our frigid mountain air causes ice to build up on the windsheilds almost every night during the winter. Using the magnetic windshield cover saves me time in the morning---no more scraping and no more having to run the car to defrost the windshield--saves me gas in the long run. Very durable and stays put even during wind storms. We had some deep snows in the northeast this past winter. I put this cover on before the snow & it kept my window clear and was easy to remove. The magnets on the ends of the fabric are very strong! I have a small car so I needed to tuck the ends into the doors, but this would also fit a larger car. I like it! I like the idea that when I leave for work and it has snowed the night before or frost is on my windshield I don't have to spend my time getting the snow off of my car all I have to do is just take my cover off and I'm ready to go. Itmakes life easier because I don't have to get out the snowbrush. I USE ONE ON MY BACK WINDW ALSO. Down here in south LA we don't have snow, but we have had frost this year...this windshield cover has been a lifesaver!!! Now I don't have to be late for work! I keep this in the car because I use it for all weather purposes. Summer is good too, to keep heat out. Did not hold up well in wind. Good for quiet frosty nights. I bought one to keep the sprinklers off my back window. Ruined a car or two. Product does what it says. However, it's not very wind-resistant. I had to buy additional magnets (more powerful) and now it works. Bought this for my husband and he loves it! Although the fabric is on the flimsy side, it definitely works. We use it on our SUV windshield and now no more having to defrost and scrape the windshield at 5 AM. We've used this same cover for over 5 winters so it has durability. As with anything else, the better you take care of an item, the longer it will last. We just had 20 inches of snow and it was so great to just take off the windshield cover and drive. There was no snow or ice to scrape off the windshield. The cover was easy to put on and take off. A great product. This is a great product especially for mild winters -I'm loving it-works great here in NC. A real time saver in the morning, easy to put on and off. Would like to have more magnets and thicker material; which would help on those occassional extreme windy/wintery days. I just bought the Car Snow Cover which is a more heavy duty version for my Dad since he lives in Buffalo where the winters are harsher. We'll see how he likes his. This windshield protector worked swell. Sure saved me from scraping in the early mornings. Covers SUV windshield fine just needs an additional inch or two on side with additional side magnets. Currently wind gets underneath and blows cover away from window. Needs More (and Bigger) Magnets! This is a great idea; I have the kind of cover that one has to secure inside the car, which often takes up too much time. 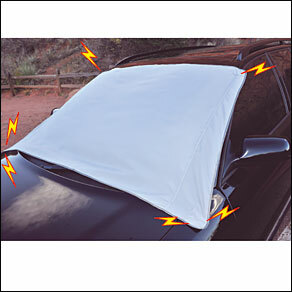 I used this cover on my car when it was in the driveway, hoping to keep the heat out of the car. A light breeze blew half the cover away. This has happened more than once. I've given the cover to a friend who has a protected carport. She added some magnets to the cover & is happy. Althought the cover went over the window very easily, I forgot that cats like to climb on cars. They apparently also like to play with the window cover. They were ablet to remove the cover very easily. Not large enough for mini vans. This would work for a smaller vehicle. My Dodge Caravan windshield is bigger than the cover. Had to add extensions on four of the tabs to make it stick to the car. I feel that this would work very good on the right car. It is a bit small for a large truck. We will see how long it lasts. We just received it. Have not had the opportunity to use this, yet. I would love to evaluate the product AFTER the first snow flies!!! I have made heavy duty ones with the ceramic magnets, and the size greater so coverage of windshield wiper area is sufficient. This one does not cover that area sufficiently. I have a small SUV. Magnets could be larger and stronger. Strong wind takes them off if it catches it right. Covers did not fit. must return..
Good if there is not much wind. Fits my wife's Mustang. She says that it needs more or stronger magnets. Light weight makes it easy for her to install. Overall design would be better if a preschooler made the item rather than low cost manufacturing. Quality would be far better than the current useless product! Love the idea that it covers my windshield very nicely, but one of my concerns was that I needed for my windshield was to keep off the morning dew and fog, it does not do that, the cover get so wet that I still have to wipe down my windows to get the water off. Little disappointed, I think the material needs to be a little heavier where the water roll s off and my windows are clear. You will have to tuck the corners inside your doors if the wind is too strong. Even the directions for use tell you that. However you can only tuck one side because when tucked it only covers 3/4 of the windshield. Very thin will not protect against hail. There has to be better windshield protectors out there. Using this is like throwing a pillowcase over your windshield. Needs to be thicker. Not really worth the money. Not recommended. Looks cheap. I would have liked this better if it had been wider. I have seen others that close inside car doors that would be more efficient at keeping windshield clear. Item was too lightweight and a light breeze blew it off the car. I modified it with some elastic straps.Seems to stay on now. It works but not like i thought it would. No, I would never buy this product again. It was so thin. Nothing is great about it. It looked heavy in the picture and when I received it it was paper thin, did not work, blew off the car windsheild and wish I could get my money back. Nothing was good about it. magnets didn't work, and like a piece of thin paper. Windshild cover is too small to cover windshield . Very disappointed. Owned one of these for years and loved it, but his one will not fit the car. I have an Edge and the cover is too narrow. It is so thin when the wind blows the snow will go underneath it. Also has pockets on the inside and we have no idea what they are for. The windshield cover was just to light weight to do any good. It is a waste of material and expense to ship and have on sale. magnets need to be better secured in the windshield cover. 2 out of 4 torn thru seaming on first use. 2nd cover that i bought so far so good. Wish this item were more durable.Have re- sewed pockets that magnets go in 2 times.More and bigger magnets might help.Also wish it fit better.Purchased this 1-5-11,and it won't make it to next winter. Stayed on car for 1 hour. won't stay on window in the smallest of wind. The magnets are worthless. They do not hold the cover in place. I tried in 5 nights in a row and the next morning the cover had fallen off. Sorry I wasted my money. I've attempted to use this twice and it hasn't worked either time. Both times I found it hanging off the side of the car. The second time I even closed the top corner in the door and it still did not stay on. Last year I used cardboard anchored by the wipers and it worked much better. Money down the drain for this. Probably another worthless Chinese product. Should have sewn in more magnets. Very thin material used. Would never have bought this if I had only known. Love the idea of the magnets, but the material is too flimsy for the overnight frost protection that I bought it for, and it could be a little bigger. Not Durable enough for Michigan winter. Ripped first use! The material did not with stand the ice that forms on a windshield. First use the fabric ripped when removing. I bought two. The second one I will use to cover furniture when painting indoors. It does not fit on my window to even tuck it into the door jams. We have high winds and lots of snow, I need to a cover that is more heavy, stronger magnets. It put it on my car and then took it right off. It may have been on the car for 1minute, the wind just tucked under the cover and it would have gone flying. I just used a regular stiff tarp and it worked better than this cover. If I was able to see this in person, I would not have purchased it. When people are purchasing a car cover and or anything without touching the item, it should at least work like it should. I will try and return this item. tried to use it in a light/medium snow, but it did not stay in place, no matter what I did with it. Very light and flimsy, and doesn't stay put. Tears easily and shreds with the slightest tension. Did not use. Threw in the garage to use as a paint drop cloth. Horrible, Horrible,Horrible. Do not waste $17 -$20.00 with shipping and handling for this piece of plastic with magnets on the corners. Stay away. I am tired of chopping off thick ice from my wind shield on bitter cold morning. If this helps some, I'd be grateful. My husbands truck must sit out in the snow. He will love this. Haha,To keep ice off the windshield, I haven't received it yet..So,I pray it works. Neighbor has one and my boyfriend wanted one so it will be a nice surprise for him! Tired of scrapping off ice in the winter. To protect leaves on my windshield. And also use this to protect snow when I go to the mountains in Winter. It looked like what I needed. Want to protect windshield from pollen and tree sap. Needed a windshield cover for winter. BEST ANSWER: Thank you for your question. We do not have the information requested. We suggest you check the website every now and then to see if a backorder date is listed. We hope this information will be of help to you.